This is a compilation of material that was posted or could be posted on Twitter. For a more coherent presentation, go to Hit Dinesh D'Souza on his Most Vulnerable Points. At least, it is hard to conceive of how somebody with a memory extending back to the 1970s could be taken in by it. In the 1970s, before Trotskyite Jews calling themselves "Neoconservatives" had acquired much influence, conservatism had not yet been entirely redefined as the demand for free markets and less government (which is actually liberalism, not conservatism). 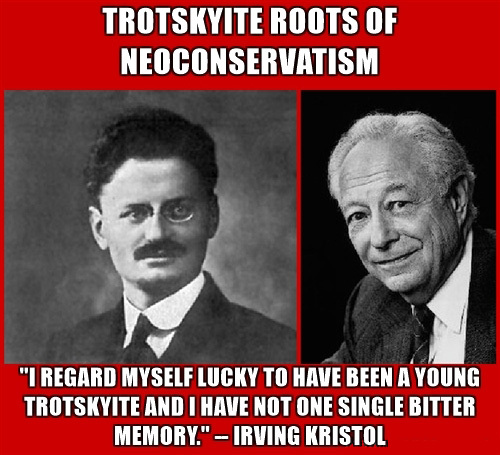 The pro-White motive in conservatism, therefore, was much more conspicuous a few decades ago. For anybody who remembers that, D'Souza's contention that Segregationists were leftists is such obvious balderdash that it requires no refutation. Certainly, Rush Limbaugh, born in 1951, knows enough that he cannot genuinely take D'Souza seriously in this -- yet he plays along. Dinesh Hides Republicans behind the word "Progressives"
D'Souza selectively avoids calling eugenicist Republicans by their party-affiliation and calls them “progressives” instead. 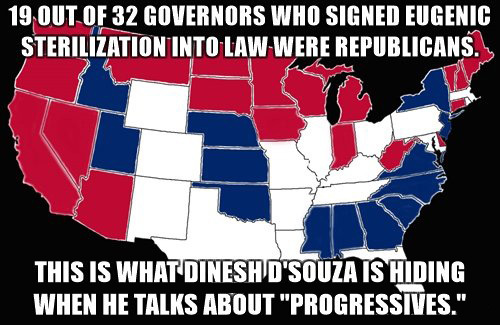 When D'Souza talks about "progressives" he is usually talking about Republicans. In fact, the label “progressive” was particularly associated with Republicans like Theodore Roosevelt. 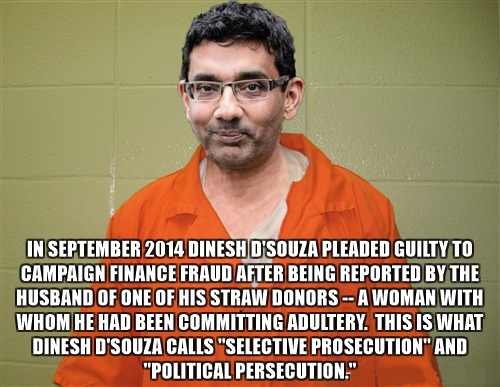 D'Souza carefully avoids mentioning this. Dinesh D'Souza has laid a booby-trap for Republicans with this book. If they follow his lead by noisily condemning eugenic sterilization, it is only a matter of time before somebody points out that it was supported first and foremost by Republicans. Even today the Republican Party has its "progressives." Dinesh D'Souza always claims that only Democrats owned slaves in 1860. When somebody cites the well known fact that Ulysses S. Grant owned a slave, D'Souza asserts that Grant was a Democrat at that time. In fact Grant was nonpartisan. Thus, Grant was a non-Democrat who owned a slave, and far from unique. Many Whigs were slaveholders. While Northern Whigs who opposed slavery joined the new Republican Party, many Southern Whigs did not. The Confederate Vice-President, Alexander Stephens, was a slaveholding Whig from Georgia. D'Souza's assertion that only Democrats owned Slaves in 1860 is false. 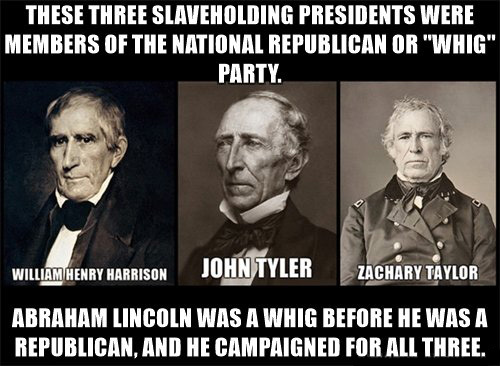 There were also some Republicans who owned slaves. Robert Jefferson Breckinridge, a slaveholder from Kentucky who favored the gradual abolition of slavery and resettlement of freed Blacks outside of the United States, may have been still a Know Nothing in 1860, but was temporary chair of the Republican National Convention in 1864. He supported Lincoln because he wanted the Union to be preserved. 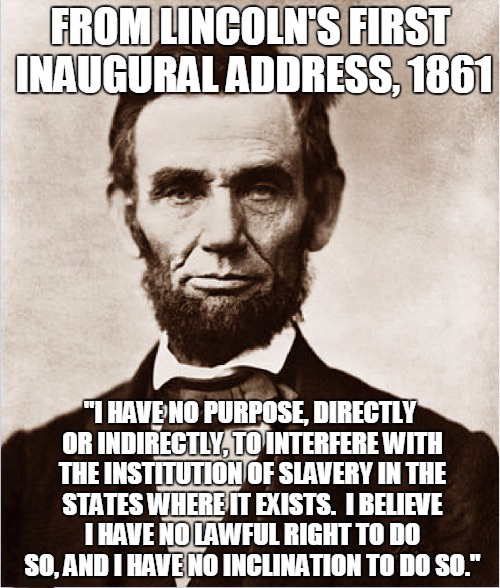 Lincoln's exemption of Border States from the Emancipation Proclamation was obviously an accommodation to supporters like Breckinridge who owned slaves. So, Dinesh D'Souza blames Democrat slaveholders but not Whig slaveholders? What about the fact that Abraham Lincoln campaigned for our three slaveholding Whig presidents -- Wm H. Harrison, J. Tyler, & Z. Taylor? 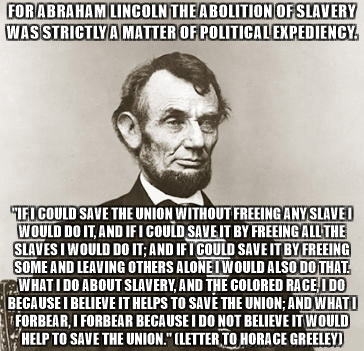 It does not seem that Lincoln was a committed abolitionist at all. In 1924. the Democratic presidential nominee John W. Davis denounced the Ku Klux Klan, while the Republican incumbent Calvin Coolidge avoided saying anything on the subject. The result was that the Ku Klux Klan supported Calvin Coolidge in 1924. Dinesh D'Souza claims that the Ku Klux Klan was "the military wing of the Democratic Party." Anybody who went to school in the United States should know that no U.S. political party ever had a "military wing." 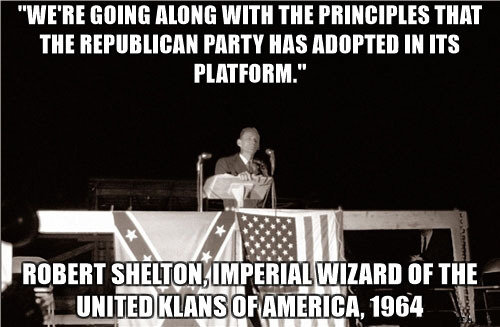 Furthermore, the Klan of the 20th century often supported Republicans. Citing Eric Foner Dinesh D'Souza calls the KKK "the military wing of the Democratic Party." What EF wrote is: "IN EFFECT, the Klan was a military force serving the interests of the Democratic party, the planter class, and all those who desired the restoration of white supremacy." Eric Foner, incidentally, is a neo-Marxist Jew from New York City. 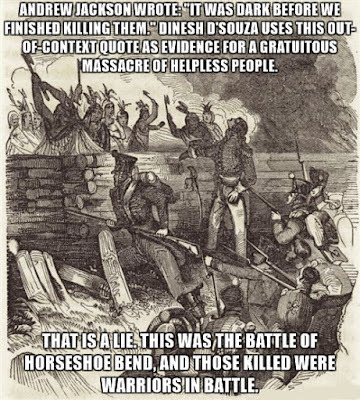 Dinesh D'Souza had to lean heavily on such disreputable sources for his book The Big Lie. 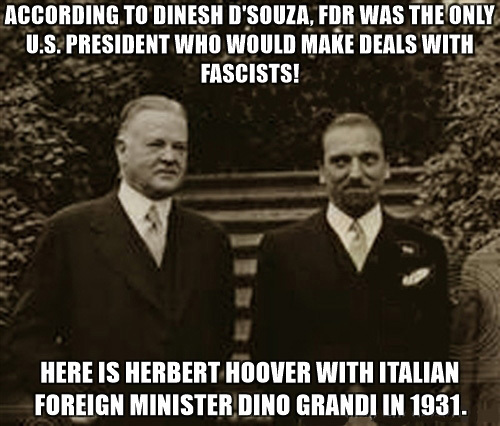 Only Democrats would make deals with Fascists? Really? The USA and Fascist Italy had positive relations, during Republican as well as Democratic administrations, until the invasion of Ethiopia in 1937. Dinesh D'Souza wants to pretend that all men of good will saw Mussolini as a bad guy from the start, and that was not the case. There used to be conservative Democrats. D’Souza pretends that segregationist Democrats were leftists when in fact figures like Senator James Eastland (Democrat, Mississippi) were regarded as extremely conservative. Conservative Democrats were not LIBERAL LIKE YOU, Dinesh. They tried to conserve the community school, States' Rights, individual rights, freedom of association, public morality, and LAW & ORDER. Would you like to explain, Dinesh, what was conservative about federally mandated school-desegregation and forced busing? It looks like LEFT-WING TYRANNY to me, and that was the consensus among White people in the South. CONSERVATIVE DEMOCRATS OPPOSED THIS LEFT-WING TYRANNY. Senators LYNDON B. JOHNSON and ALBERT GORE, SR. were NOT TYPICAL SOUTHERN DEMOCRATS. They both REFUSED to sign the 1956 "Southern Manifesto" of opposition to federally mandated racial desegregation. Two of the 101 Southern politicians who signed the Southern Manifesto were Republicans from Virginia. They claim, "Democrats voted against Civil Rights," or even, "More Republicans than Democrats voted for civil rights." Both claims are false. The vote was very regional. Not one Southern Republican voted in favor of that Act. The only Southerners voting for it were a few Dems. Dinesh D'Souza says: "Every segregation law in the South was passed by a Democratic legislature and signed by a Democratic governor." This is literally impossible, since most of those states had adopted anti-miscegenation laws before the Democratic Party even existed. One state of the "Jim Crow South," West Virginia, received its segregation-laws under Republican rule, beginning with Arthur I. Boreman in 1863. The eugenicist movement was weaker in the former Confederacy than in the rest of the country. While 32 out of 48 (67%) of the United States enacted eugenic sterilization laws, only 55% of former Confederate states enacted such laws, compared to 70% of the other States. 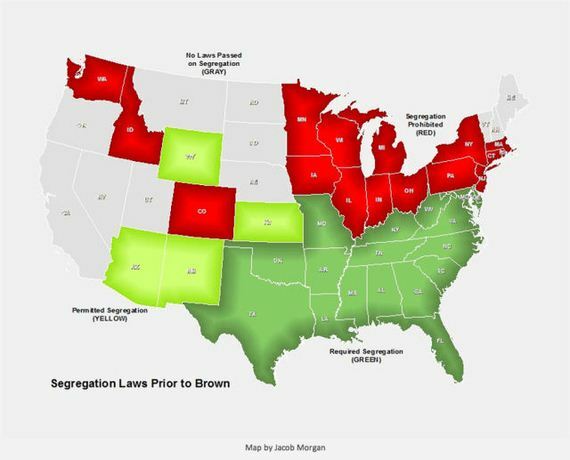 17 states had MANDATORY racial segregation. Of these, only 9 (53%) enacted eugenic sterilization laws. 16 states PROHIBITED racial segregation: Of these, 11 (69%) enacted eugenic sterilization laws. There was NO RELATIONSHIP between racial segregation and eugenic sterilization laws. 23 out of 32 states that enacted eugenic sterilization laws had no mandatory racial segregation. In fact, states with mandatory racial segregation were somewhat less likely to enact eugenic sterilization laws, compared to states without racial segregation. White Southern Democrats started voting for the GOP because Richard Nixon in 1968 and 1972 seemed to oppose forced busing. 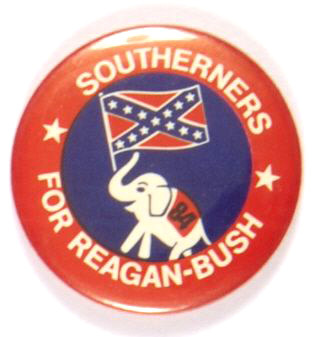 This method of winning the segregationist vote for the GOP, called Nixon's “southern strategy,” was devised by Kevin Phillips. Dinesh D'Souza tries to obfuscate the well known fact that most Southern segregationists switched to the GOP by putting the focus on Segregationist politicians, of whom very few switched parties. Major racially motivated D to R switchers: S. Thurmond, J. Helms, T. Cochran, J. Tower, T. Lott Charles Pickering, James F. Byrnes, Albert Watson, William Cramer, Arthur Ravenel Jr., Dave Treen, James D. Martin, Floyd Spence, Bo Callaway, Iris Faircloth Blitch, Mills Godwin. Not many segregationist politicians changed parties, because the Democratic Party continued to be dominant until 1980. Politicians like Senator James Eastland (who died in 1979) would have been less influential in the GOP. But those segregationists were conservative! Some significant public figures from the South who switched from the Democratic to the Republican Party are: John Tower, 1951; Strom Thurmond, 1964; Jesse Helms, 1970; Trent Lott, 1972. More Democratic than Republican politicians voted for the Civil Rights Act of 1964: in the House there were 153 D and 136 R votes in favor; in the Senate, 46 D and 27 R votes in favor. And of course it was signed by a Democratic president, sleazy LBJ. In 1964 there were, from the former Confederacy, 12 Republican Congressmen and 1 Republican Senator (John Tower of Texas): every single one of them voted against the Civil Rights Act. The racial attitudes of the two parties by 1983 can be roughly gauged by the Senate's vote on a holiday to commemorate MARTIN LUTHER KING. While majorities of both parties voted for the holiday, ONLY 4 DEMOCRATS -- BUT 18 REPUBLICANS -- VOTED AGAINST THE HOLIDAY. 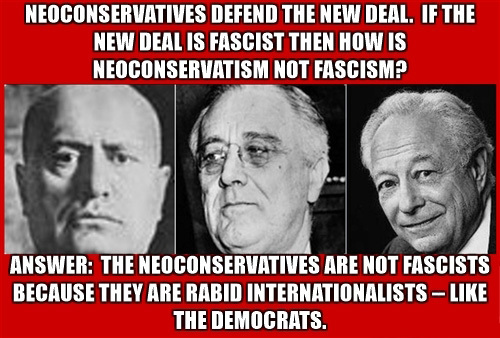 As it turns out, what D'Souza calls “the nazi roots of the American left” are, on the one hand, “progressive” Republicans, and, on the other hand, conservative Democrats that have now migrated almost entirely to the GOP. D’Souza pretends that “progressive” Republicans and conservative Democrats were the same group. Furthermore, he wants us to believe that they were all left-wing Democrats. Clearly, none of them were left-wing Democrats! In America: Imagine the World Without Her, Dinesh D'Souza declared that "there was no genocide" of American Indians, that this was just another Big Lie by the left to make Americans ashamed of their country. But now Dinesh D'Souza himself is telling this "Big Lie." 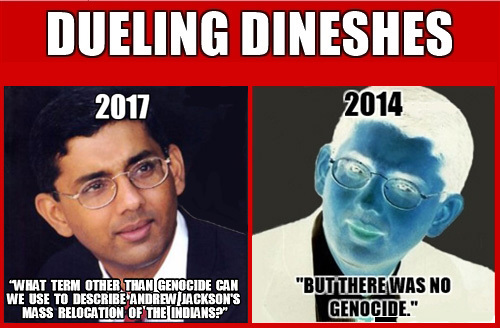 Dinesh D'Souza quotes Andrew Jackson out of context, "It was dark before we finished killing them," and leads his readers to believe that this refers to an act of genocide. In fact those killed (generally) were warriors fighting to the death in the Battle of Horseshoe Bend. Dinesh D’Souza’s attack on Andrew Jackson as a “racist” would instantly be recognized and reviled as Cultural Marxist propaganda if it were not clothed in Republican partisanism. 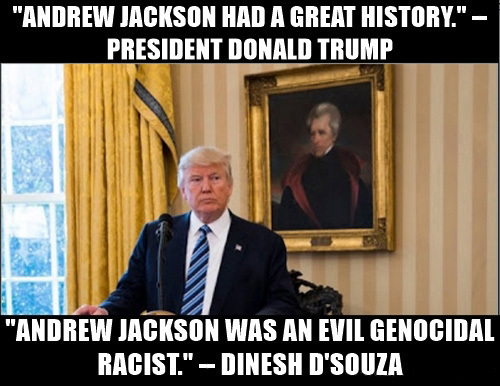 What do you think President Trump would say about Dinesh D'Souza's attack on Andrew Jackson as a "racist," given Trump's admiration for President Jackson, and the fact that he has been compared to President Jackson (and likewise called a "racist")? These are points that any sincere person should be able to grasp without much difficulty. One could also dispute D'Souza's assertions about fascism, but because it is a more obscure subject your interlocutors will find the argument harder to follow. Therefore it is better just to point out the misrepresentations about American political history. One young woman asked me if there were another book that I could recommend to her, perhaps one that refutes D’Souza. I told her that I was writing that book.